Spring season is here in St. Paul, Minnesota and this usually means that it is time to do some spring clean-up, do any repairs and get the yard ready for the summer time. This also means that it is going to be the rainy season here in Minnesota, and thinking of your gutters is a good idea. When gutters get full of leaves and other debris it can cause water backup and create serious problems for your home. At Minnesota Leafless Gutters we are here to provide you with all of your gutter needs in order to choose a gutter you like that will match your home, and to prevent serious water damage to your home. Although gutters may seem like a small part of the functionality and maintenance of your home, gutters will prevent water damage that can even damage your foundation and cost you big money. When you are thinking about installing gutters, or improving gutters for your St. Paul home Minnesota Leafless Gutters is here for you. We have multiple styles, sizes, materials and colors. When you are choosing to put something on your home, you want it to look great and that is why we are here to work with you. Not only do you want something that is aesthetically pleasing but functionality is important. When it comes to gutters and living in Minnesota, we have a lot of trees and that equals a lot of tree debris. When it is fall time you have the leaves, and when it is spring you have seed pods and these often fill you gutters. To prevent this from happening and to free up sometime from you having to clean your gutters or having to hire someone to clean them for you, gutter covers are a great option. Gutter covers or gutter guards will cover your gutters and keep them clear so that water can run smoothly down the spout as it needs to. 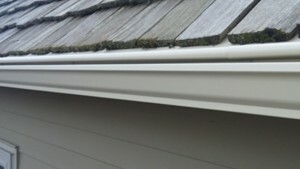 They can be installed with your new seamless gutter system or onto your existing gutters, in most cases. We help you stay off the ladder and keep the leaves out of your gutters. Gutter guards are custom and guaranteed just like our gutters. We want to keep your home looking great while also limiting the maintenance each year that is required to make sure that you do not have any water damage. Make your life easier and call us so that we can install gutter guards for your St. Paul home.